While employed as a scientist/engineer for a large manufacturing corporation, I pulled a stint as trainer for my company’s Total Quality program. This role occupied half of my time for three or four years. A large component of our Total Quality initiative was related to Statistical Process Control (SPC). And of all the volumes of course materials used in this training, the most useful was a small, 136-page book called Understanding Variation . What made the book so useful was its down-to-earth approach to SPC and its reliance on real business and manufacturing examples. After discussing the randomness but orderliness of data, the book introduces time series charts. Basically, a record of performance is put on paper, in graphical form, so a quick glance can show whether things are on track. Once you have such a chart, you need a system that helps indicate how much variation is acceptable, and how much means the process is out of control. The gray vertical lines separate adjacent weeks. Without any special training, one could look at this data, see that it varies, and say that “some days are better than others”. But we have no way to characterize the variation. Walter Shewhart first applied some simple but effective numerical techniques to this type of data, and he called the result “control charts”. While the techniques were relatively simple to apply, they were based on solid statistical methods. We still can’t say anything more insightful than the data is distributed about the mean. In order to judge the variability in the data, we need first to quantify the variability. This can be done by analyzing a moving range chart, which is an effective measure of variation in the data, and simpler to compute than the standard deviation (at least in the days prior to desktop computers). Essentially, for a given day, we plot the absolute difference between that day’s value and the previous day’s value. We still don’t know how much variability is “acceptable”, that is, attributable to common variation in the process. This is where some calculations are required. When using the moving range to determine “typical” variation, the maximum acceptable value of the moving range is 3.27 times the mean of the moving range. For this data, the mean of the moving range is 3.2, so the maximum acceptable moving range, or the Upper Control Limit for Ranges, is 10.5. The variability in moving range is well under the Upper Control Limit (UCL). We can use the moving range to compute the control limits on the individual values data: the mean of the moving range is multiplied by 2.66, then added to and subtracted from the process data mean (this is roughly equivalent to using 3 times the standard deviation of the individual values data). Our Upper and Lower Control Limits (UCL and LCL) are thus 28.1 and 11.1. In conjunction, these two graphs comprise an XMR chart, because it analyzes the X (individual values) and MR (moving range) data. A quick glance at these charts shows that the process data falls well within the upper and lower control limits, that is, it is operating within the bounds of random variation, and we can say that the process is “In Control”. In truth, there are additional tests for randomness, because any patterns in the data even within the control limits means the process may be “Out of Control”. A detailed treatment of these additional tests is beyond the scope of this introduction. In addition to the XMR methodology, there are several other types of control charts, which are used for different types of data and data collection. I plan to describe them in a future post. This example shows how to build a run chart with a mean and lines for one standard deviation above and below the mean. For an “official” run chart calculated based on mean and standard deviation, the upper and lower control limits are usually set at ±3 SD. It is a simple matter to adjust the example to show any control limits you have calculated. 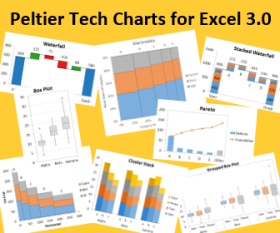 This links to a zipped workbook that uses VBA code to adjust the chart when the data changes. The positions of the lines are adjusted for changes in the data, and the points are formatted so that points below the mean are filled with blue and those above white, while diamonds are used for points within one SD of the mean, circles for two SD, and triangles for three SD; points outside of the control limits are red squares. Historical note: This was the first chart I ever formatted point-by-point with VBA. Back in Excel 97 on an underpowered Windows 95 laptop, it was very slow, taking almost a minute to process the chart as seen above. It happens in a flash in Excel 2003 on a computer with enough juice to support Windows XP. If you have a need for extensive Statistical Process Control capabilities, then you are not likely to want to build an entire solution yourself. There are a number of commercial packages that provide SPC functionality for Excel. There is one in particular which I will mention here: SPC for Excel. Written and supported by a client of mine, Business Process Improvement, or BPI Consulting, SPC for Excel is a turnkey SPC system in the form of an Excel add-in. SPC for Excel is compatible with Excel versions 2000 through 2007; this reduced view of its Excel 2007 ribbon tab shows the capabilities of SPC for Excel. Posted: Thursday, May 1st, 2008 under SPC. Tags: control chart, Run Chart.